What would the #Battle4Atlantis look like in the #Battle4TBT2019? What's better than some pre-Thanksgiving, daytime basketball? That's exactly what we get on Wednesday afternoon when Florida and Oklahoma go at it in the first round of the annual Battle For Atlantis. While neither team was predicted to finish particularly high in their respective conference this season, what can't be denied is that these two programs have produced a whole lot of talent over the past decade-plus. Let's see what that looks like on a TBT court. Nobody personifies basketball in the Sunshine State quite like Udonis Haslem. A native of Miami, Haslem won two Florida state championships in high school, led the Florida Gators to four NCAA Tournament appearances in college, and has won three NBA championships with the Heat. With a resume like that, only one thing remains: bringing a $2 million check back to Gainesville. Considering UF has won two NCAA championships and advanced to seven Sweet Sixteens over the past 12 years, the Gators are all but ready to make a deep TBT run. While there are a plethora of guards that Coach Haslem can choose from to run the backcourt, Scottie Wilbekin and Lee Humphrey are no-brainers. Over the course of his four-year Florida career, Wilbekin led the Gators to the 2014 Final Four, was named 2014 SEC Player of the Year, was a two-time SEC All-Defensive Team member, and became one of the most revered players in school history. That success has followed Wilbekin to the professional ranks. Just this last year alone, he was a EuroCup champion with Darussafaka, named EuroCup MVP, and named EuroCup Finals MVP. Humphrey is a man who needs no introduction, but we'll give him one anyway. The 2007 grad led Florida to back-to-back NCAA National Championships in 2006 and 2007, broke the NCAA record for 3-point field goals in NCAA Tournament play (55), and was so lethal from downtown that he ripped a net in an NCAA regional game against Oregon. If you thought that backcourt was scary, just wait until you see positions 3-5. Also a member of the 2006 and 2007 NCAA championship teams, Corey Brewer gets the nod at small forward. After being named NCAA Final Four Most Outstanding Player in his junior season, Brewer entered the NBA draft and was selected seventh overall by the Minnesota Timberwolves. Although he hasn't found a home yet this season, Brewer has played in 783 career games between the TWolves, Mavericks, Nuggets, Rockets, Lakers, and Thunder. At the other forward is big Marreese Speights, who was on the 2007 NCAA championship team, won an NBA championship with the Warriors in 2015, and is currently balling alongside Overseas Elite star Kyle Fogg in China. During his sophomore (and final) season with the Gators in 2007-2008, Speights averaged 14.5 ppg, 8.1 rpg and 1.4 bpg. 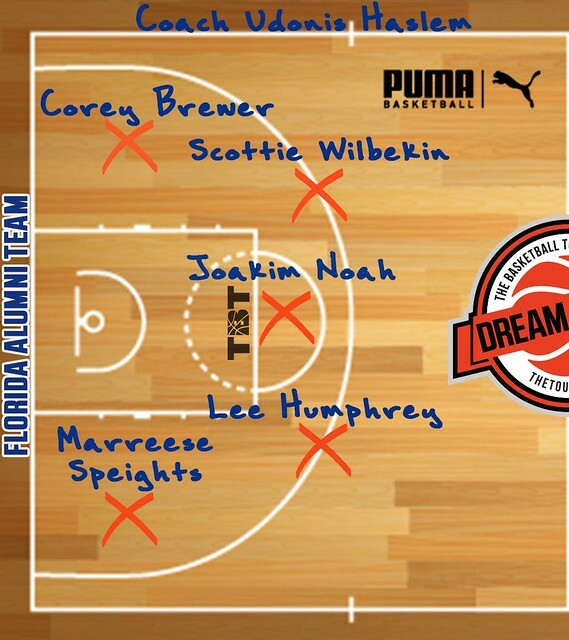 Rounding out the starting five is arguably the most recognizable UF player in recent memory in two-time NCAA champion Joakim Noah. While he may not be an NBA free agent for much longer, if you have an opportunity to go to battle with an NCAA Final Four Most Outstanding Player, two-time NBA All-Star, and NBA Defensive Player of the Year, you do everything possible to make that happen. While they would certainly come in as the underdog, a team of Sooners alumni would be a worthy opponent for the Gators. Much like Haslem in respect to Florida, Coach Blake Griffin lives and breathes Oklahoma basketball. Born in OKC, Griffin won four Oklahoma state championships in high school, had one of the best two-year runs in college basketball history with the Sooners, and ultimately got his No. 23 retired in the Lloyd Noble Center rafters. Oh yeah, he's also had a Hall of Fame NBA career. Even though he's 39-years old, who wouldn't want to see Oklahoma legend Hollis Price run the point one last time? Widely regarded as the best player in program history since Wayman Tisdale, Price led the Sooners to the 2002 Final Four, won a program-record 110 games, and racked up more awards than we have fingers and toes. Who better to pair Price with than one of the most recent OU products in Jordan Woodard? The 2017 grad finished his Sooners career fourth all-time in assists (471), fifth in made free throws (440), seventh in steals (186), eighth in free throw percentage (81.2%), eighth in total minutes played (3,735), and 14th in points (1,440). At one forward is Oklahoma's version of Iron Man. 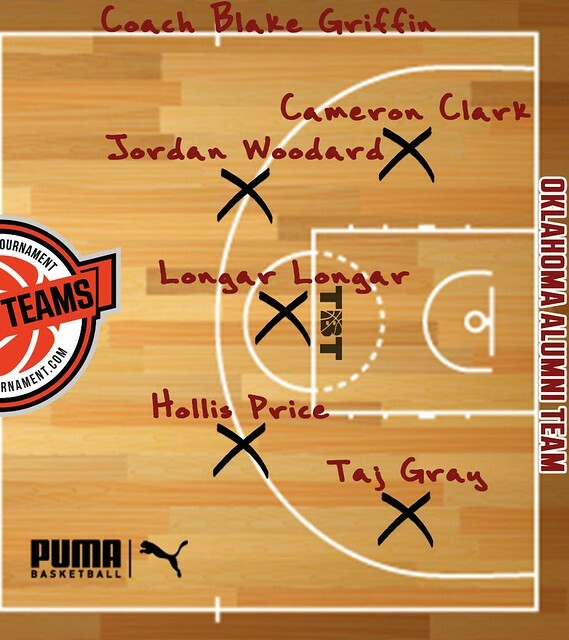 During his Sooner career, which spanned from 2010-2014, Cameron Clark did not miss a single game. He finished 19th all-time in scoring (1,284 points), seventh in games played (128), and seventh in 3-point field goal percentage (.398). In his senior season, Clark was named to the Third Team All-Big 12 after averaging 15.6 ppg and 5.5 rpg. He's joined at the other forward by Taj Gray, who transferred to Oklahoma in 2004 after playing his first two years of collegiate ball at Redlands Community College. It did not take long for Gray to make an impact. In his first year in Norman, Gray averaged a team-high 14.6 ppg and 8.2 rpg and was named Big 12 Newcomer of the Year. He averaged similar stats his senior season and took home first-team All-Big 12 honors. The only thing this squad is missing is a prolific shot blocker. Good thing Longar Longar played his college ball at Oklahoma. Longar averaged at least one blocked shot per game in each of his final two seasons. In his senior season (2007-2008), he was also the team's second-leading scorer (11.4 ppg), rebounder (5.6 rpg), and field goal shooter (.488).